Bulk Earbuds As Low As $0.72 ea! Pack of 100 disposable ear covers. Keep your headsets clean during training and shift changes. Sennheiser CSTD-01 Cable for use with any Sennheiser QD headset and most desk phones but please call for compatibility if you have never ordered before. 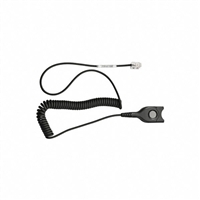 Sennheiser CSTD-08 QD Cable for use with all Sennheiser QD headsets and specific phones. Please call for compatibility if you are not sure. 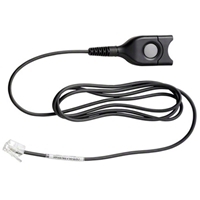 10 Feet extenstion cable for all Sennheiser office headsets. Sennheiser Cava 31 Cable for use with any Sennheiser QD headset and Avaya 1600 & 9600 series phones.